Meet Zack. He is a hardworking guy from Coral Gables, Florida and is a life-long Ford enthusiasts. He’s a mechanic who spent much of his life playing with cars and trucks. He likes to go fast. There is arguably no better truck for a hardworking guy than an F-150. There’s definitely no better truck for a guy that likes to go fast than one of Ford’s hottest sport trucks. It’s the one that struck his fancy far harder than the rest — the Ford Lightning. This pivotal event made Zack a life-long fan of Ford’s first-generation performance pickup. It didn’t take him long to become complete immersed, learning all he could about the famed Lightning. During his research, he figured out that Ford made the first-gen Lightning for three years and only offered them in three colors. Instantly, his goal became owning one truck from each year in all three paint options. Stance is extremely important when it comes to any ride. Zack Rankin’s ’95 Lightning is not only super clean, but sits perfectly, too! Sometimes it's the little things that make a build stand out. Zack’s truck is simple, but has some really nice touches that set it apart. His Lightning sports all of the original badges, but they have been relocated, giving the truck a subtle custom image. All good things must sadly come to an end, Zack ended up needing to sell the truck in 2007. He tells us it was a very sad day. Having to sell something you worked so hard to achieve is always difficult. Zack’s hard work was noticed, and in time, it would be rewarded. From the back the truck looks super clean. The rear bumper has been replaced with a roll pan, giving the truck a much sportier look. Knowing what Zack’s first Lightning meant to him, his mother wanted to do something special for him. In 2012, she surprised him with another black 1993 vintage Lightning. To say Zack was extremely grateful is a gross understatement. 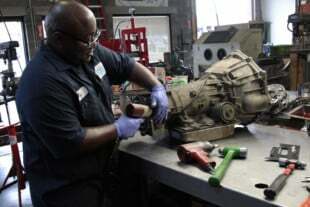 When it came to the engine, Zack turned to legendary Ford engine builder Ronnie Crawford to put it together. It started as a factory 315W roller block. Displacement increased to 408 cubes and the rotating assembly fortified with H-beam rods and forged pistons from D.S.S. Racing. A set of Trick Flow cylinder heads and a Trick Flow Stage 2 camshaft complete the long-block. The engine is rounded out by a Trick Flow Race intake manifold. The lower manifold is fully ported. With an immeasurable amount of sentimental value already in the truck, Zack set out to make it everything he wanted. He started with the engine, and it all came full circle when he went to Ronnie Crawford to build it. The front office is nothing short of immaculate. Save for some gauges and an aftermarket radio, this is how the truck rolled off the assembly line if 1995. A few simple interior upgrades allow Zack to pump his favorite Brittney Spears CD while keeping an eye on whats going on under the hood. But it didn’t stop with the engine. The rearend has also been upgraded to handle the extra power. It turns the cleanest set of vintage Convo Pros around, which adds to the super-sano, old-school look of this truck. The interior is impeccable and completely stock. When you open the door, it’s like going back in time to Ford dealership in 1995. The original feel of this truck is a large part of what makes it so cool. Although the truck sounds perfect in most ways, Zack isn’t done. Love is a funny thing. There is nothing in the world that compared to the love a mother and son share. Although Zack lost his mom, she left him with something he loves, and it will also keep her close in his heart. Having a truck could never replace a parent, but for Zack, his Lightning is something extremely special that will always keep his mother close to him. Is there a better gift from a mother to a son?